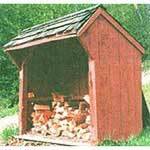 Store firewood in a shed especially made for your firewood storage needs. 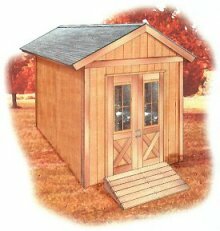 Organize your wood and keep it covered and dry during the wet months with a firewood shed. Decide how large of a shed you need and if you just need a roof and floor, or want something more classy. Whichever firewood shed you have in mind to build, start cutting costs at the very beginning by using free plans. Be sure the firewood you buy for the winter is dry. Right after it is cut, the wood is green. 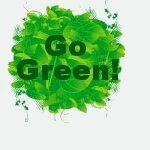 Green or damp firewood causes more carbon dioxide and smoke. Look for seasoned wood when buying firewood. If the ends of a log are splitting and cracking, the wood is probably dry. Green firewood will have moisture. Check the ends for dampness indicating green wood. Also damp wood will be heavy because of the moisture. You can also hit 2 logs against each other. A clunk sound indicates dryness whereas a thud indicates moisture. 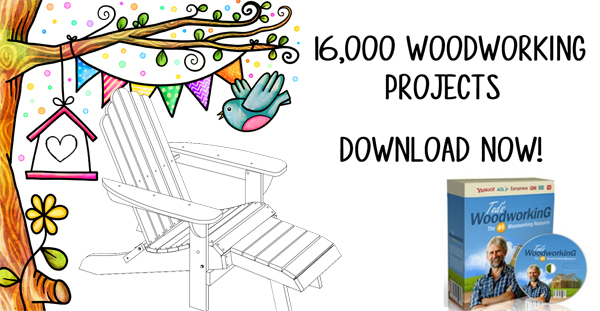 Here is a downloadable plan for building proper storage for firewood. 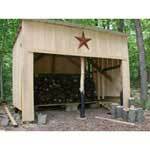 This tall wood shed has a wide open front for ease of stacking wood and retrieving it. 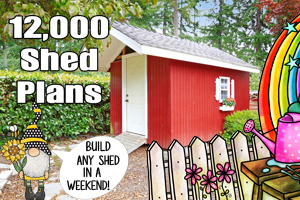 These instructions serve the purpose of getting you started in building a shed and to be creative with what you have on hand. 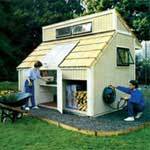 Here are plans for building an attractive garden shed that has a large outside cubby hole for storing firewood.